In 2018, Hanoi will drastically improve its investment and business environment and facilitate innovation and startup initiatives to develop enterprises and boost economic growth. 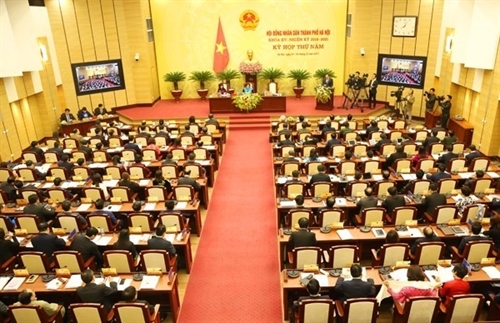 Under Resolution on Hanoi’s 2018 socio-economic development plan, which was adopted on December 4 at the fifth meeting of the Hanoi People’s Council (the15th tenure), the capital city will continue restructuring its economic sectors in close association with renewing the growth model and increasing productivity, quality, effectiveness and competitiveness of such sectors. Hanoi will pay greater attention to the development of cultural, educational and healthcare non-business services while ensuring social welfare and security and improving people’s living conditions. The municipal People’s Council also sets a gross regional domestic product (GRDP) growth rate of 7.3-7.8 percent for 2018. The social investment capital and goods export value are also set to increase by 10.5-11 percent and 7.5-8 percent, respectively. In addition, the capital aims at providing nearly 100 percent of the urban population and 55 percent of rural inhabitants with access to clean water. It will strive for a health insurance coverage of 85.3 of the population and have 80 more public schools meeting the national standards in 2018. To achieve the above targets, Hanoi will promptly remove barriers and solve difficulties for local enterprises and promote innovative startups, aiming to increase the number of newly-established enterprises by at least 12 percent next year.